Education is big business in Canada, to the tune of $2 Billion each year. Tens of thousands of foreign students arrive to study in places such as Vancouver and Toronto annually. With this influx comes a corresponding demand for student housing which puts pressure on an already undersupplied market. A big problem? Not for smart real estate investors, many of whom are the parents of these students who value a Canadian education. Canadian colleges and universities hold a lot of prestige and Vancouver area schools are benefitting from efforts by student housing investment developments being created. This yearly migration which will continue in 2018 and beyond, is now growing partly due to President Trump’s immigration policies in the US and a sharply rising US dollar. Those who looked at the US first are choosing Canada instead. The reason foreign students prefer Canada is many — cheaper tuition, cheaper accommodation, less crime, and a more inviting environment compared to the US. Canadian cities are more ethnically diverse and appear more welcoming. And students can stay and work in Canada for 3 years after graduation which gives them valuable work experience and income. In the US, they may get booted out right away. One year of education plus accommodations at a US university might carry a price tag upwards of $70,000. So the preference for Toronto and Vancouver is growing. Since cost is the number one issue for most foreign students, Canada is very inviting. But cities such as Vancouver or Toronto have a persistent problem — a lack of affordable condo apartments for foreign students. That persistence spells sustainable investment ROI. There are already 353,000 international students in Canada and the plan is to attract 450,000 by 2022. That’s 25,000 more per year for the next 4 years. These foreign students now make up 1% of Canada’s population. And some of the students are now adults who are arriving here with their young families. The BC government says it has attracted 130,000 foreign students and claimed that they inject $2 billion each year into the economy, creating 29,000 jobs. And with hundreds of thousands of Canadian students pursuing a post secondary education as well, you can see how the demand for student housing would go unfulfilled. With regular Canadians unable to find homes, the situation for foreign students is even tougher. Condo prices and rental leases in Vancouver are unaffordable. A typical scenario for these Canadian and foreign students is a 6 person condo where each student pays $500 to $800 per month which translates to $3000 to $5000 in monthly revenue. In Vancouver, that number is typically higher. Interest in that type of student housing solution is strong, however the type of living arrangement is not conducive to study or living. 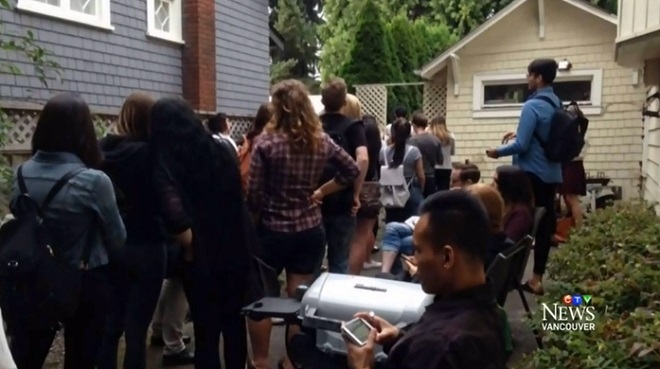 Foreign students rarely feel they will fit into what they may see as a “frat house” situation. One notable form of housing for foreign students is new condo buildings built specifically with their needs in mind. And many of whom are from wealthy families and can afford the more exclusive units. Prospective buyers from China, South Korea, Dubai, Russia, United Emarates, Brazil, India, Turkey, Columbia, Mexico, Germany, and Japan value a Canadian post secondary education very highly. So highly, in fact, they’re willing to buy an appropriate condo to ensure their sons or daughters have a comfortable optimal situation in what is to them, a strange and scary foreign location. They’re spending a lot of money and want to ensure this once in a lifetime opportunity is successful. Some of the sponsoring parents look to buy a home here in Canada. In fact, the rising demand from Chinese buyers is well known. They’re even blamed by the provincial governments as the source of housing crisis in Vancouver. They want to be with their kids and experience living in the world’s best city – Vancouver. Who can blame them, and since Canadian education services are a potential international trade strength, it makes sense to develop the foreign education market. While the foreign buyer’s tax was applied in Vancouver and has slowed sales of units, the interest from investors has returned somewhat. Those who bought into student housing condos 4 to 6 years ago, have realized an extra bonus on their property. After their children are educated, they have sold their units for a phenomenal capital gain. But the rental income here is perhaps still some of the best rental income opportunities in North America. We all know the average price of a condo in Vancouver is around $660,000 and those in Richmond are right smack in the vicinity of so many colleges and university campuses. And given the $1 million average home price (with no availability) the interest in condominiums is strong and expected to perhaps grow. The city of Vancouver is committed to high rise development and urban intensification and apparently approve of the new wave of foreign students. If they aren unable to support these students needs, then the free market is stepping up to fill the void. It’s a lucrative market you need to investigate. If you’re interested, contact Joyce Soo of Sutton Seafair Realty in Vancouver BC (604) 273-3155. ← Previous Post: Usage Based Auto Insurance – Should You Use Telematics?